Corey can saw cut bars for customers that require stricter than normal length tolerances or that cannot use a shear cut end. 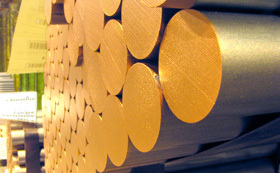 We can saw cut bars in a bundle or singly to length tolerances as close as 1/4 of an inch. Additionally, to meet increasing demand for shorter than standard bar lengths, Corey uses the saw as the final production operation. Shorter bar lengths are frequently ordered for use with automatic bar feeders that have been retrofitted on older screw machines or with newer machines designed to use shorter bar lengths, especially in the larger diameters. Shorter bars are easier to handle and vibrate less as they are fed into a screw machine.